Maiko on Gojobashi Bridge. Postcard-size real photo taken in Kyoto. She has been poorly posed. 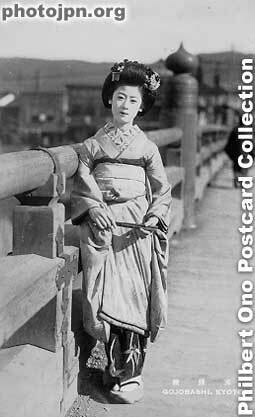 Her posture is bad, her kimono is ruffled, the sleeves look bad, and her feet are pointing in the wrong direction. Maiko usually know how to pose themselves. Postcard-size real photo taken in Kyoto. She has been poorly posed. Her posture is bad, her kimono is ruffled, the sleeves look bad, and her feet are pointing in the wrong direction. Maiko usually know how to pose themselves for a photograph. But not this one. Perhaps she's an amateur. There are many tours and packages in Kyoto who dress and make up normal young women to let them have a Maiko or Geisha experience for a fee. They are sometimes allowed some hours to walk in the streets to further their experience. No inproperly trained woman would be allowed to be in public in her gear so most likely the woman shown in the picture is a tourist.